There has been a lot of debate about the ideas of Sugata Mitra. He tends to get under teachers’ skins, especially those in ELT. Find a nice summary of these posts / discussions through this post. I’m kind of confused by all the kerfuffle. I’ve been writing and thinking about Mitra’s constructivist premised ideas for 7 or 8 years and have seen his plenary a few times. It’s nothing new but somehow in ELT it is now a hot potato topic. I think this points to our insularity as a profession (and also sensitivity towards the security of our own jobs) than anything else. I also think most posting about what he’s experimenting on (and Mitra is very clear that he’s experimenting and not making stark conclusions) are missing the key points he’s trying to make. The debate isn’t about declaring teachers defunct or of technology as a panacea. This totally misses what he’s really talking about …. Mitra is seeking to close the distance between students and knowledge/learning, the distance that traditional school sets in place. That’s his main point. This doesn’t mean we won’t need teachers, just that a teacher’s job might be quite different and about creating the conditions of learning and not controlling the processes of learning. 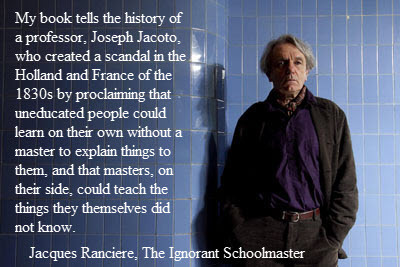 Mitra is also along the lines of Ranciere, suggesting that teachers can teach things they do not know – that there might be an important role for “ignorant” teachers to play. 2. I also think Mitra is most importantly trying to address the crucial question of where all the teachers will come from in a world with an exploding population and need / hunger for education. He’s positing a solution to this and showing through technology, there is another way for the billions to gain quality education without the creation of a vast infrastructure nor a huge expenditure. he’s for providing access to all the “slumdogs” of the world. And again, he’s asking us, where will all the teachers come from, to teach as our traditional schools presently do? We certainly don’t have an answer to that and continuing down the road the present paradigm/system offers, will doom billions to poverty and mcjobs. I could point out many weaknesses in Mitra’s work. There are a lot of holes and he also doesn’t address a number of crucial variables regarding the implementation of his ideas. I’ll refrain from a long post commenting on these, they are obvious. However, let’s applaud him for raising these two issues to the forefront where they rightly belong. PS. – I highly recommend this, as Mitra’s best lecture and presentation of his ideas. A must to watch and think about ….